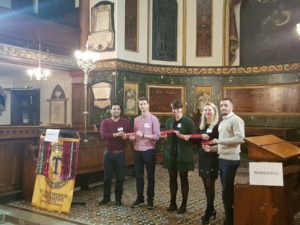 The most friendly and supportive (non profit) public speaking club in the City of London. Our next meeting will take place on Wednesday, April 24th, 2019 at 6:45 pm. Feel free to join us in Saint Botolph's Without Aldersgate Church, Aldersgate St, London, EC1A 4EU. Looking to improve your Public Speaking, Communication, Leadership Skills and confidence? We welcome guests to attend multiple meetings for FREE! Membership is only £72 for 6 months, we are non profit. 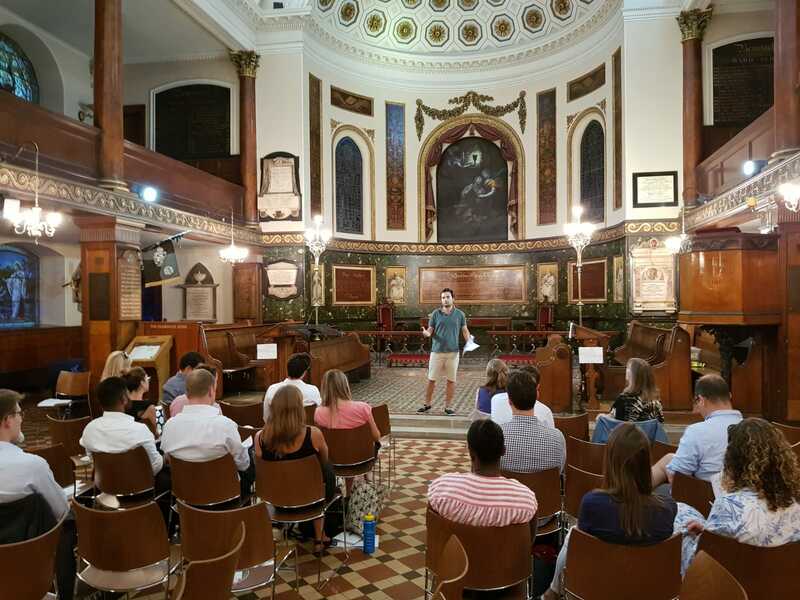 London St Paul's Speakers Toastmasters Club is a public speaking club based in the City of London. We aim to provide a fun and encouraging environment for our members and guests to develop their speaking and leadership skills. We meet on the second, fourth and fifth Wednesdays of the month at 6.30pm. Meetings last around two hours and include prepared speeches, evaluations and table topics (impromptu speaking). The various aspects of the meeting allow you to learn how to present confidently in a wide range of situations, think on your feet and listen effectively and deliver constructive feedback. [email protected] Please include your name to register as a Guest. Facebook page for our club. Please do Like us! Company LinkedIn page for our club. St Paul’s Speakers had an invigorating evening with four fantastic speeches, four insightful evaluations, and a full set of table topics. The meeting began with our Club President – Rakesh kicking things off by asking the audience what they think about Pret a Manger. A seemingly innocuous question, but Rakesh masterfully turned it into a contemplation of courage, friendship, and the common threads that bind us all together. The toastmaster for the evening was Florian, who took command of the evening with characteristic charm and confidence, starting by leading the audience thorough a set of breathing exercises and vocal warm ups. An excellent way to combat those pre-speech nerves! The first of the functionaries was the timekeeper, Ann, who gave a clear explanation of her role, and of the importance of keeping in time. Our grammarian Myra followed, explaining her role and disclosing the word of the day – rendezvous. The first speaker was Mark doing his Icebreaker. He told us of his misadventures at the Chessington World of Adventures Resort, where he was kicked out of the park for jumping out of a ride but still managed to get a full refund on account of bad weather. There’s nothing more fun than playing the system, even at an amusement park. Well done to Mark on his Icebreaker! The second speaker was Pedro, who reminded us all of the importance of failing in life. He skillfully combined the stories of four success icons – from JK Rowling to Michael Jordan – to highlight the importance of perseverance and resilience for real success. A very welcome reminder for some of us! Robyn was our third speaker and told us of her passion for running. Following nicely from Pedro’s speech, Robyn told us of her initial failed attempts at running, only to find a passion for it later in life. She has now secured a place at the London Marathon (out of more than 400,000 applicants!) and is getting ready for the challenge. Good luck Robyn! Our final speaker was Ricardo, who told us about the time he booked a lavish five-star holiday to Turkey. To his chagrin, a visa faux-pas meant that he spent the night in a criminal detention center near the airport instead of a luxury suite. Well-deserved for abusing that corporate credit card! Next up were the speech evaluators, Christelle, Rakesh, Alessandro, and Sarah. They all gave the speakers excellent feedback on their stage presence, delivery, use of language, and movement on stage. Such judicious and thoughtful evaluations do St. Paul’s Speakers proud! Our Table Topics Master Caroline followed with a wonderful display of wit and stage presence. She produced a list inviting table topics, such as what to do after winning the lottery, what to throw away from your partner’s belongings, and how far you would go for an autograph. The Table Topics winner for the evening, Nathan, told us of the time he left work in the middle of the day to greet the Arsenal players and have his expensive Thomas Pink shirt covered in signatures. We hope he will wear it to our meeting soon. Sarah, our Topic Evaluator, gave excellent feedback to every speaker, barely stopping to look at the notes that she hid out of sight. An impressive display of memory! Her feedback was personalized and helpful. At the end of the meeting, Theo from Kings Cross Speakers acted as General Evaluator. He gave us great feedback on our meeting, including trying to have a theme for the evening. A missed opportunity with Valentine’s Day around the corner (and a good reminder for those of us who had forgotten!). Congratulations to all the speakers, new members, and a special thanks to Theo for being our General Evaluator for the evening. 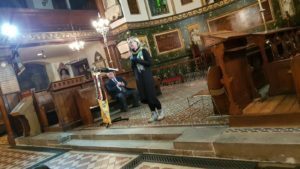 Another uplifting rendezvous at St Paul’s Speakers. 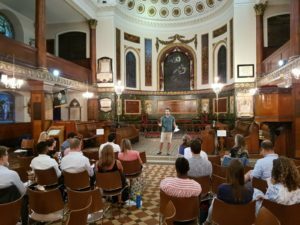 St Paul’s speakers put on a fantastic evening with two great speeches and a tour de force workshop on the use of rhetorical devices. The meeting began with our Club President – Rakesh taking to the stage to kick off the meeting and tell us about his love for metaphors and Katy Perry. The toastmaster for the evening was Chris, who managed the evening with the confidence and aplomb of a seasoned member. The first of the functionaries was the timekeeper, Nicolas, who gave a succinct explanation of his role and seemed eager to use the red card (as he would later in the evening!). The first speaker was Christelle, who asked whether people are born to run a marathon. She told us about the challenges of running 26.2 miles, and about the evolutionary advantages of being able to run long distances. She invited us to think of running as a meditative activity. She must have run before the meeting because she delivered her speech with total calm and composure. The second speaker was Sarah, who talked to us about the power of music. She told us that music is found in every country, in every culture, in every age of human civilization. She explained how music has the power to move us all, from a fetus to an Alzheimer’s patient. The audience was gripped, but the content was too interesting to do it justice in seven minutes, and it wasn’t long before our timekeeper Nicolas reached for the red card! 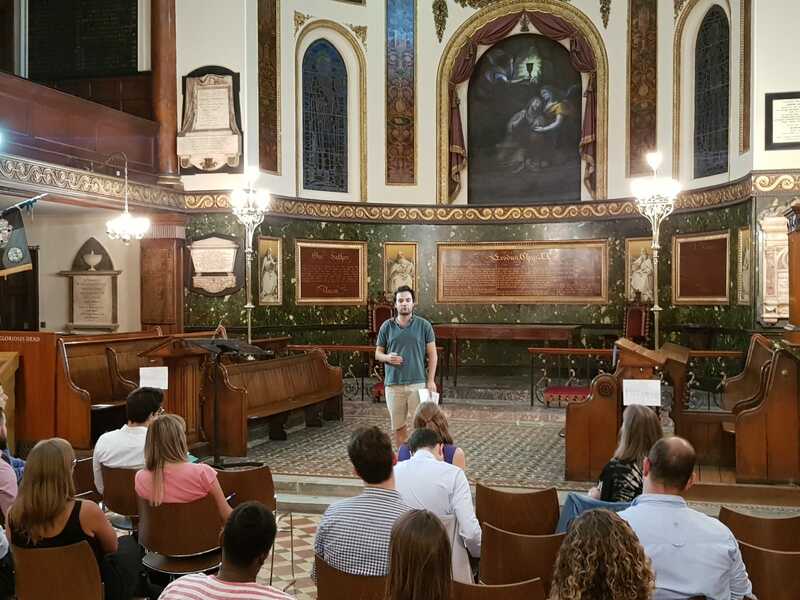 Next up were the speech evaluators Alessandro and Michelle who gave the speakers excellent feedback on their stage presence and use of language. Kudos to Alessandro for stepping up to the role at the last minute. Acting as Sergeant at Arms, Torrey took to the stage to introduce our guests with efficiency and composure. After the break, Paul Carroll gave a fascinating workshop on rhetorical devices. He highlighted some of the metaphors and similies used by the Christelle and Sarah in their speeches. He explained that we often use rhetoric without being aware of it. He took us back to ancient times, when people felt warm and safe in the sunlight, but cold and afraid in the dark, leading to the ubiquitous use of “up” or “high” as metaphors for a positive state of mind, and “down” or “low” as their opposite. He encouraged ample audience participation, which made the workshop interesting and engaging. And there was time during the workshop for a couple of table topics too. Agata gave us a metaphor for Brexit, reflecting the mood that something (anything!) should happen soon to resolve the impasse. Nathan reminded us that the British enjoy pain (as per Brexit), so safety equipment should not be introduced to sports such as Rugby. Well done to Nathan for his third table topic in four meetings! 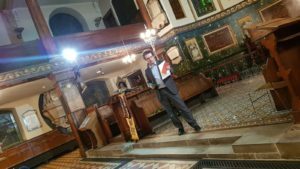 After the workshop, Chris took back to the stage for a bit of club business – a club special election. A few members had already volunteered for positions in the St Paul’s Speakers Club Leadership Committee, and Chris asked if anyone in the audience wanted to put themselves forward. Alas, nobody did, so the candidates ran unopposed and we didn’t get to see their impassioned campaign speeches. Next time! Congratulations to all the speakers, to the new committee members, and a special thanks to Paul for the wonderful workshop on rhetorical devices. Another excellent evening at St Paul’s Speakers. 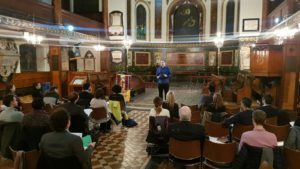 St Paul’s speakers once again put on a splendid evening with many great public speakers taking the stage. The meeting began with Allessandro acting as Sergeant at Arms, coolly going through the housekeeping and then welcomed president Rakesh to the stage. In typical Rakesh style, he bounced onto the stage with energy and enthusiasm as he kicked off the meeting in style. The toastmaster for the evening was Adam, and with great charisma and style he managed the meeting with aplomb. The first of the functionaries was the timekeeper, Ricardo, who arrived late for the meeting, but just tin time to get to the stage. He compared speeches to subway sandwiches; they can’t be too short otherwise you’ll be unsatisfied and nor can they too long or you’ll feel bloated! 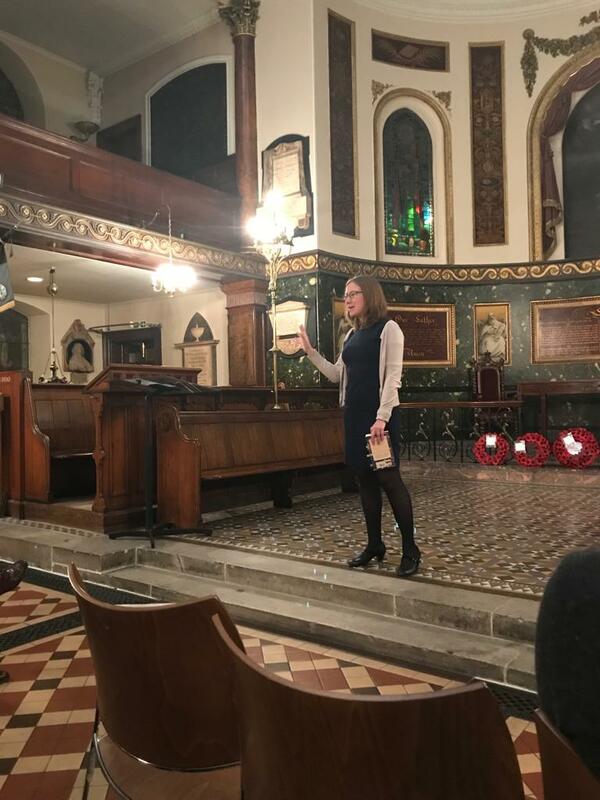 Next up was the grammarian Sarah Beckwith, who introduced the role succinctly and when she delivered her report; she highlighted all the interesting language used throughout the evening. The first speaker was Robyn. who delivered her icebreaker. She gave us an insight to the lives and careers of her grandmother, her mother and herself. She spoke with warmth and energy which was infectious. The second speaker was Christelle, who explored how hair and how people perceive different types of hair spoke volumes of inequality and suppression in parts of the world. She commanded the stage and delivered an impassioned performance. The final speaker of the evening was Alex, who persuaded us that in order to achieve, we need to improve our skills to reach success. With reams of enthusiasm and energy, Alex speech went down as a success. Just before the break, Allessandro returned to the stage to welcome the guests which he did with composure, despite there being 12 guests to the club. After the break we had the evaluators and first up was Anthony evaluating Robyn. He commended on all the great items in her Icebreaker, with some pointers on how to improve as she continues her Toastmasters journey. Lewis evaluated Christelle, who praised her intriguing subject matter and gave some notes on she could add more emphasis to her message. 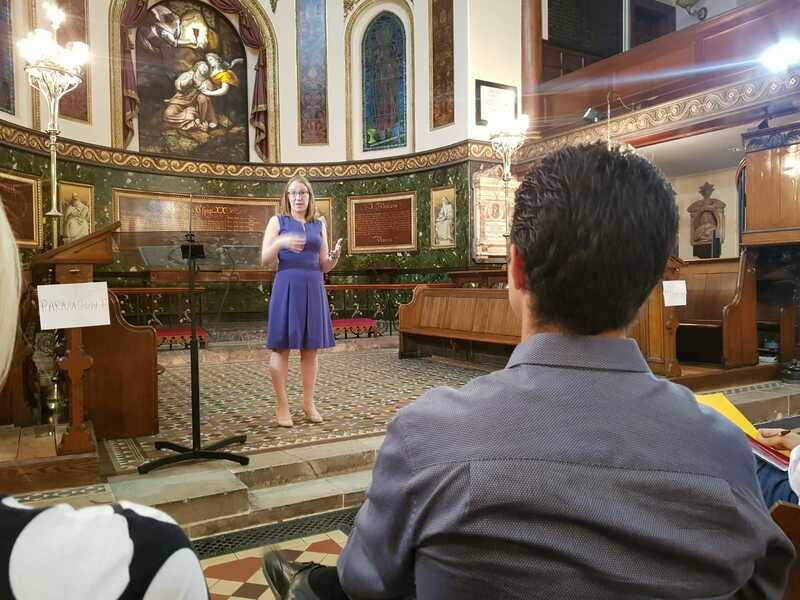 The final evaluator was Sarah Hawkins evaluating Alex, who accompanied commendations with thought provoking recommendations to help Alex elevate his status as a speaker further. The next part of the evening was Table Topics, orchestrated by Tom. He had a cheeky grin throughout as he gave us ‘Newspaper’ themed Table Topics and that enthusiasm spread through to the audience and the speakers. Notable speakers include Sarah Hawkins whose front page story was a failed Everest Hike in the company of an ex-boyfriend, Lewis‘ ideal holiday if her were a mouse would be in Paris like the film Ratatouille and Martin he said that it’s okay for men to weak bikinis… just maybe not if you’re going to meet the queen. 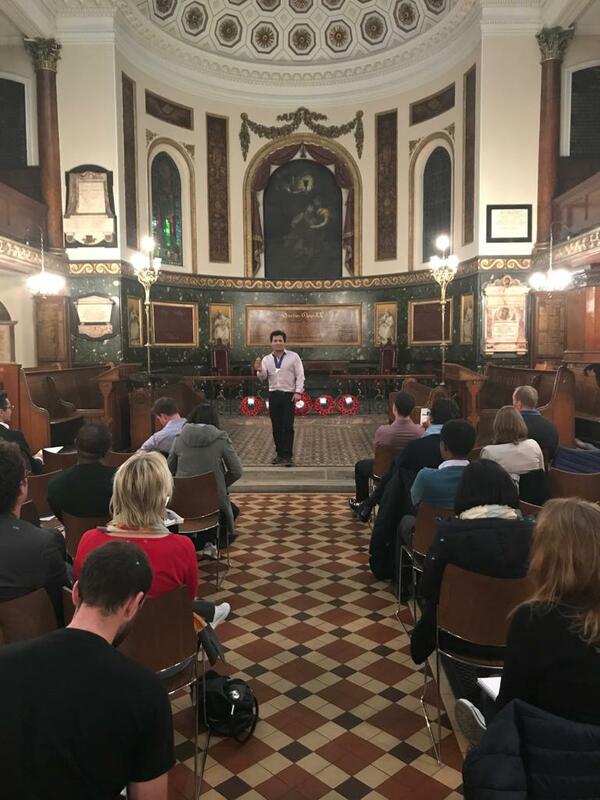 Rakesh was back to the stage to evaluate the table topic speakers; and he managed to evenly balance commendations and recommendations for every one of the many speakers. The general evaluator for the evening was Frank Milani, who had been listening intently and had plenty of praise for those who hadn’t been evaluated. Congratulations to Alex and Christelle, Rakesh and Sarah Hawkins who were the winners on the evening for Best Speaker, Best Evaluator and Best Table Topics respectively. 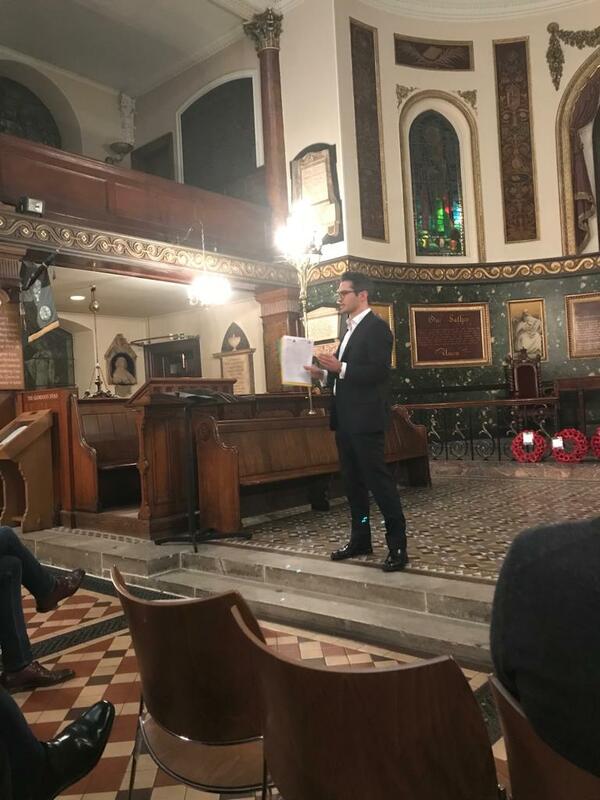 All in all, another excellent evening at St Paul’s Speakers. 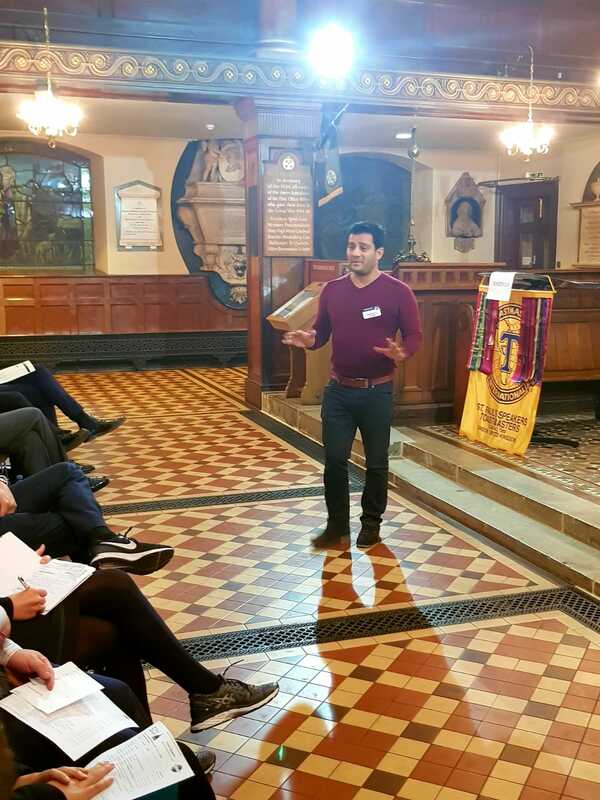 St Paul’s Speakers were proud to welcome Tazud Miah to the club for their last meeting. The 2017 Evaluation District Champion delivered a workshop which inspired the members to give some stellar evaluations. Before the meeting began, Tom Dury took to the stage as Sergeant at Arms. He clearly stated the housekeeping requirements and authoritatively brought the audience to quiet in order to begin the meeting, as he welcomed the President. President Rakesh, after a month’s hiatus, came to the stage with confidence and charisma which set the tone for a great meeting. Rakesh introduced Toastmaster for the evening, Caroline, whose confidence came through and immediately had the audience at ease. She welcomed Timekeeper Michelle who would give the speakers concise timing reports; commending those who that kept to their allotted time and for those who took a little too long, notes to take away and improve. The Grammarian of the evening was Myra, whose natural delivery put the audience in safe hands as she explained her role. Her report noted al the intriguing use of language which was used throughout the evening. Caroline then welcomed the First Speaker, Tazud, to deliver an educational speach on evaluations. 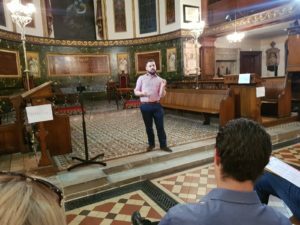 With the use of a projector and enlisting an unexpecting member of the audience to do an impromptu table topic, his speech was relevant and entertaining for all audience members, including guests who hadn’t been to Toastmasters previously. He packed his speech with lots of technical content which the evaluators of the night would then implement. The next speaker was Chris, who spoke on different types of leadership. Chris’ conversational tone was welcoming on audience ears as he gave personal examples of leaders he had experienced in his life. The third speaker was Kash, whose speech centred on beginning with the end in mind. The message of his speech was about always having a purpose with whatever you do, and his impassioned delivery conveyed that message throughout. Tom returned to the stage to invite guests to introduce themselves. He asked them to state their favourite fruit; a question which sparked unexpected controversy as one guest stated ‘Kiwi’ to the horror of another guest as it later transpired that she was allergic to the exotic fruit. That type of welcoming question was perfect to get guests out of their shell. After the break, Anthony had the unenviable task of evaluating a speech on giving evaluations. Nonetheless, he succeeded in providing sound technical insights into what worked well about Taz’s speech and managed to pick out some recommendations. Next was James who gave a relaxed delivery on Chris speech. 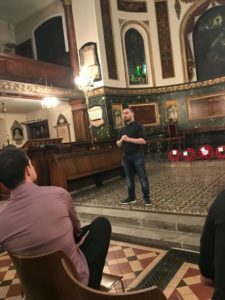 He also added some context saying that it had been years since he had seen he had seen Chris deliver a speech which was a nice touch for new members and guests to see that perseverance with Toastmasters can yield great results! Finally was Rakesh, who in his evaluation, embodied the passion present in Kash’s speech. He commended Kash on his delivery and stage presence, but challenged him to add more highs and lows, so that the speech followed more of a rollercoaster ark. Table topic Master for the evening was Sarah Hawkins whose theme centered around memories. It was a great topic for members and guests alike and a special mention goes to Ricardo. 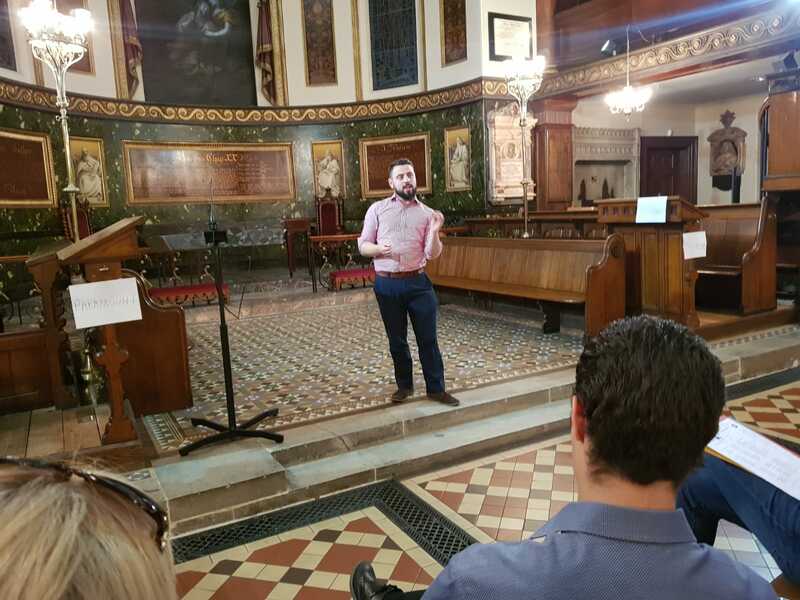 Ricardo recalled a recent memory of celebration; flying over to Ireland and a study-cramming session in order to pass the Irish Law Bar exam, so that he would still be an EU qualified Lawyer post-Brexit… an impressive feat recalled to the audience with an equally impressive delivery! Tazud returned to the stage to give a masterful general evaluation, free from using notes he gave his observations to the club as whole and those yet to be evaluated. With an eloquent delivery and measured insights, Tazud gave a great reflection on what was a great evening. The winners of the evening were Kash, Rakesh and Ricardo for Speech, Evaluation and Table Topics respectively. Our next meeting is on Wednesday 24th October. 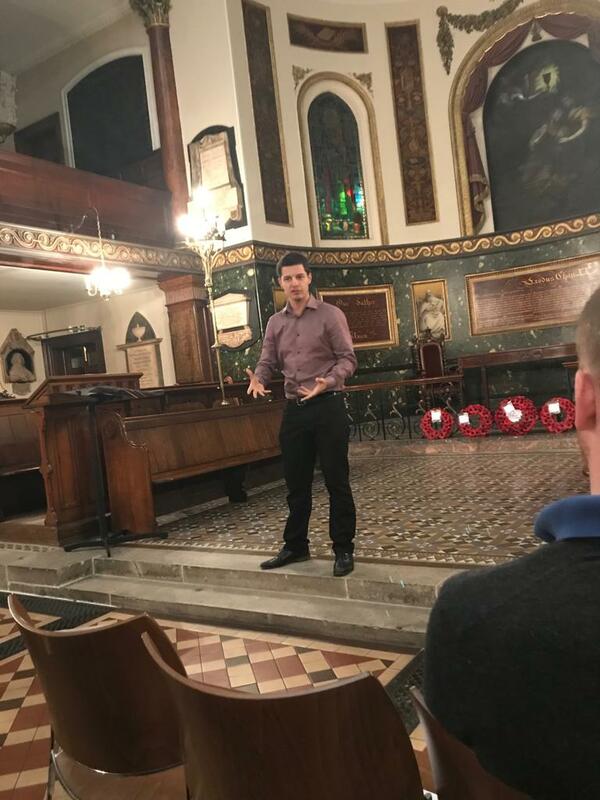 It will be the last meeting before our very own Lewis Kyriacou represents St Pauls Speakers and Area C in the Table Topics Contest at Division. 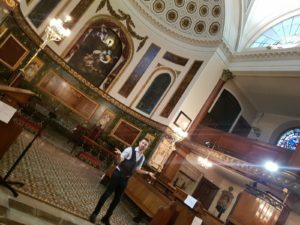 If you’re thinking about attending St Pauls Speakers as a guest come along on 24h October! St Pauls Speakers once again hosted an evening public speaking fun and excellence. Assuming responsibility for President, in the absence of Rakesh, was Sarah Hawkins; who commanded the stage and set the tone perfectly for the evening’s events. 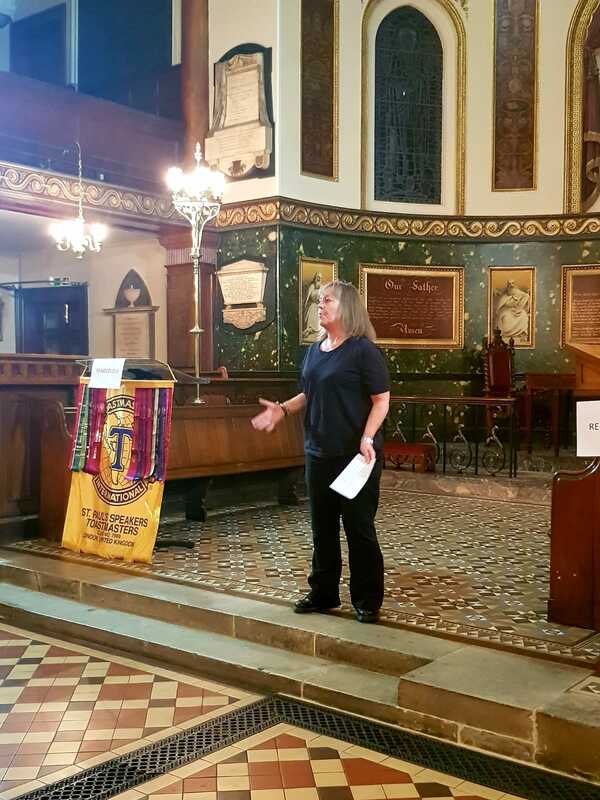 Due to a Tube Strike on the Picadilly Line delaying the Toastmaster, Sarah Hawkins as acting president introduced the first functionary; Anthony as Timekeeper. 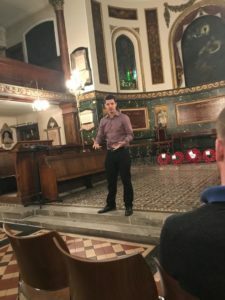 Not only did he acutely explain the importance of a meeting running to time, throughout the evening he gave accurate reports and context as whether speeches met the Green Light, Yellow Light or red light. 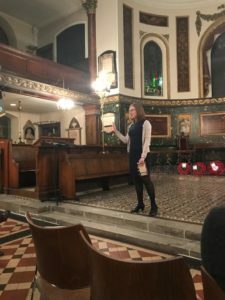 Then, having persevered through the worst of the strike, Sarah Beckwith came to the stage as Toastmaster and handled the rest of the evening with accomplishment and ease, putting the speakers and the audience in complete comfort. The first speaker was Myra, delivering her Icebreaker. She told us a story of a childhood trip to Wales across “The Wobbly Bridge.’ An insight into a holiday without the iPads and consoles that would accompany children today, Myra delivered with an enthusiastic tone throughout. Sarah Hawkins returned to the stage as the second speaker of the evening, delivering her (long overdue) Icebreaker Speech. She used the metamorphosis of a caterpillar to butterfly as a metaphor of how transform your life of one of trouble into one of happiness. Accompanied with an identifiable structure and deliberate stage movements, Sarah delivered a relatable and entertaining speech. Michelle delivered a master class in how to become a millionaire, emphasising the importance of commitment to a single goal and eradicating any time that does not meet that objective. With a clear structure and commanding tone, Michelle gave the audience tools to go away and make improvements in pursuit of millions. The final speaker of the evening was Sergey, who gave a speech on the impending impact on Artificial Intelligence. Having researched the topic well, Sergey delivered his material confidently to the audience. Lisa was the Sergeant at Arms for the evening and, as a brand new member to St Pauls Speakers, welcomed all the guests with charm and when asking them to introduce themselves, she did so in a friendly and inviting way. After the break we had the evaluators. First up was Anthony (temporarily stepping away from timekeeping) who evaluated Myra’s speech. In what was Anthony’s first evaluation, he gave sound recommendations and encouraging commendations for Myra to implement in Project 2. Ling evaluated Sarah’s speech and gave plenty of commendations in what was an excellent speech, as well as recommending Sarah give diligent consideration for time allocated to different sections of the speech. Returning to the stage for her third role was Sarah Hawkins to evaluate Michelle. Articulately structured and packed with great technical observations, there was plenty of Michelle to take into her next speech. Finally was Lewis who evaluated Sergey’s speech. He commended Sergey on the structure of his speech with some recommendations to bring his well researched topic to life even more. Table Topic Master for the evening was Robyn, who gave the speakers obscure headlines from newspapers she had encountered in the previous week. With a plethora of guests taking to the stage, all of whom taking to the stage with a lot of heart and enthusiasm, the winner was the newest member to St Paul’s Speakers Lisa. Lisa spoke naturally on her topic with composure and humour. The General Evaluator was Jamie Hamer, a former member of St Pauls Speakers. 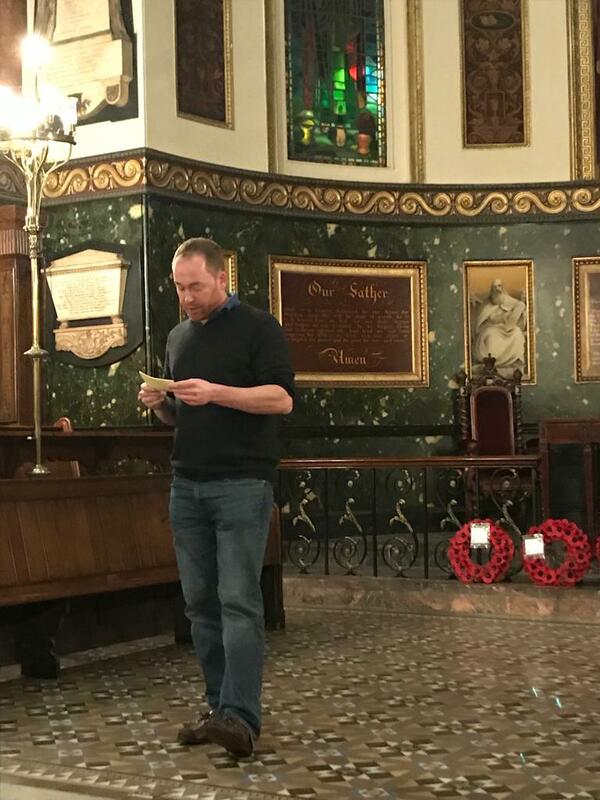 Unaided by notes, Jamie spoke powerfully into the space giving the club and it’s member insightful feedback on what was great and what could be done even better. In addition to Lisa, Table topic Winner, a special congratulations go to Sarah Hawkins who won both Best Speaker and Best Evaluator of the night. We look forward to seeing our returning members and welcome guests for our next meeting on Wednesday 10th October. A Barrrel of Laughs – St Pauls’ Speakers’ Competition Time! 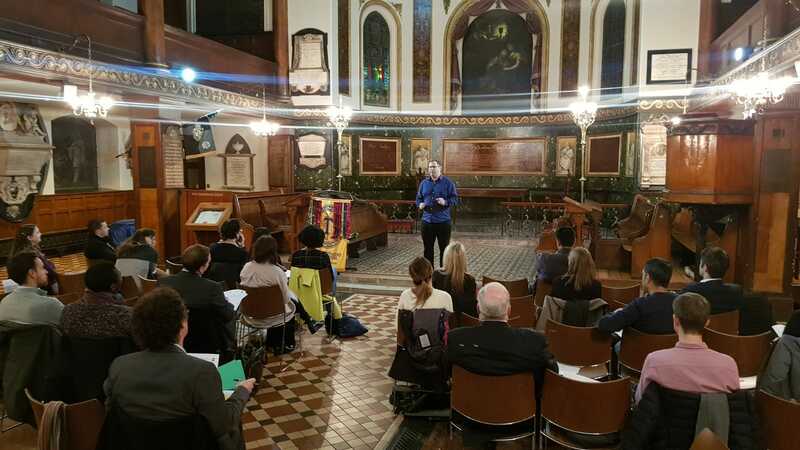 Members and guests to St Paul’s Speakers witnessed a competition of the highest calibre, as they held their annual Humorous Speech and Table Topic Contestants. In a packed schedule with a full roster of 5 speeches and 8 table topics; it’s of a testament to all the competitors that the laughs kept coming throughout the night. The competition chair was for the Humorous Speech Contest was Caroline, whose assurance and confidence kept the pace and energy between the transitions of the speakers being welcomed to the stage. 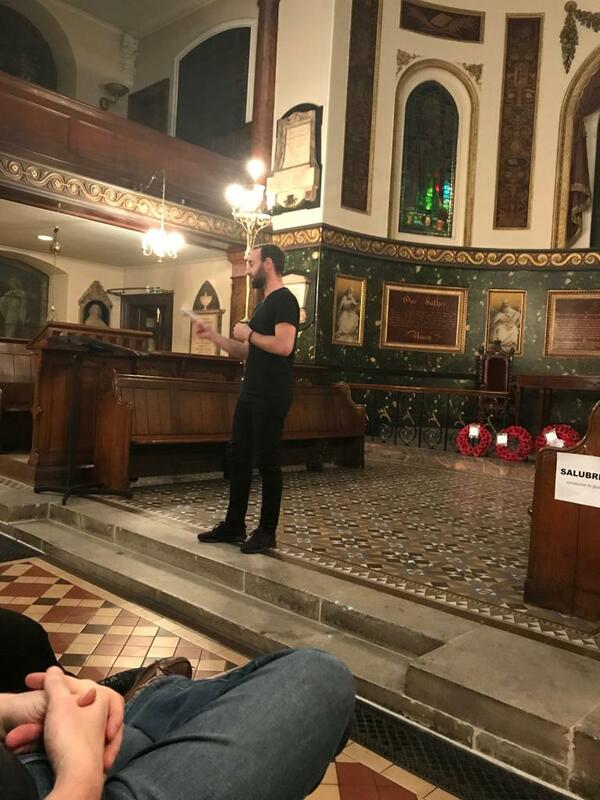 First up was Adam, who regaled of his former passion for dancing… despite having little discernable talent on the dancefloor. Upon this realisation, he then began to shy away from that self expression at every opportunity; he now never lets loose on the dancefloor… not even on his Wedding Day! Next was Michelle, who as a confessed beauty fanatic, endured a weekend of camping for a mother-daughter bonding session. In her speech, she managed to find the funny side of what she and the campmaster would class as “survival essentials”; although it definitely wasn’t funny at the time! 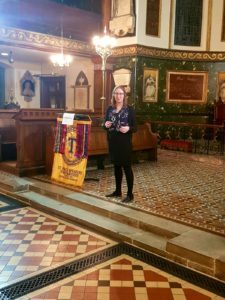 Sarah Beckwith then recalled a how the climb up Machu Pichu was described as a ‘three out of five’ out of difficulty… yet her tales throughout that experience suggested anything from it! Moments to sit down were regularly exploited across the grueling trek, with Sarah delivering a stern warning for people to think twice about a ‘three out of five’ difficulty level! Ling delivered a charming account of her life, from the pressures from her parents to her first steps in public speaking. Such an honest portrayal with wit and laughter at every turn, the audience was enthralled by her story. Lewis shared some tales of his friends “Al Cohol” and “Ang Over,” and how one night of heavy drinking cause him to fall and hurt himself, be late for work and have the police called to his house! Ling came first, with Lewis and Adam coming second and third respectively. After Then were the Table Topics, Sarah Hawkins acted as chair and gave the contestants this topic to ponder: “What day in your life would you like to relive. Kash gave an honest account of how he had actually had an arranged marriage described to the audience that unique day with wit and humour. Caroline, departing from her first role as contest chair, recalled her excitement when, on her 13th birthday, her mum allowed Caroline her first sip of cider… she found it so disgusting that she’s never touched the drink again since! Lewis gave a heartfelt account of how one of his School-day Public Speaking Wins was tainted somewhat by getting into a fight with a bully the next day. But it was in the moment of receiving the award at the school assembly in front of his peers, and how the feeling of acceptance was one he cherished. Lewis claimed first Place, with Caroline and Kash picking up Second Place and Third Place Respectively. A great testament to all Table Topic contestants that there were no disqualifications. The competition was a great success and great thanks go to club President Rakesh. 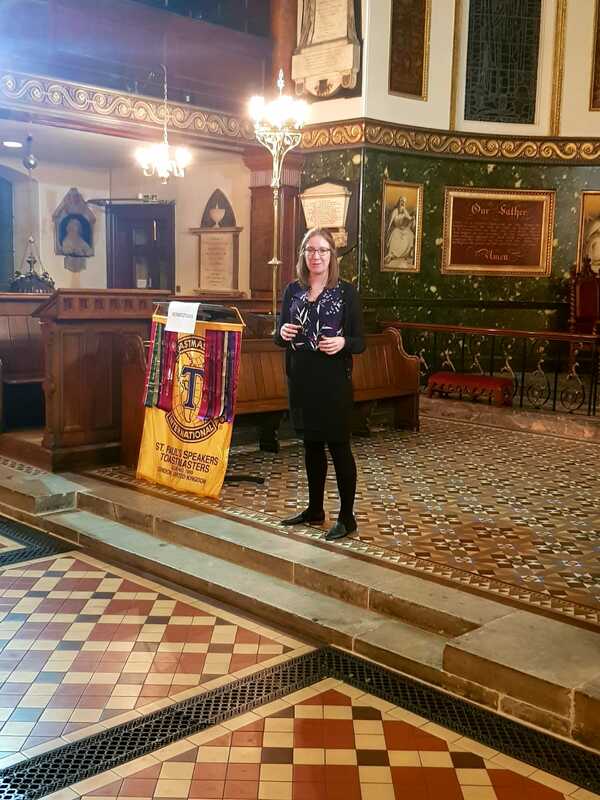 Whilst the President couldn’t be there in person, he rallied to ensure the club had enough judges (a total of nine) and that members who were indicisive about competing took part… including the winner Ling! Also, many thanks to the guest judges, timekeepers and ballett counters who made the evening possible. The Area Competition will be held on Monday 15 October at Cass Business School, 106 Bunhill Row, London EC1Y 8TZ, United Kingdom. at 6.30pm. Please come along and support Ling and Lewis, as well as an opportunity to the the funniest speeches and sharpest improvisers Area C has to offer! 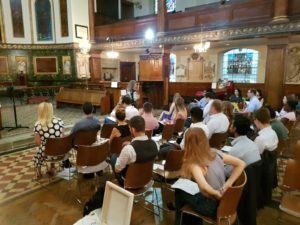 This Wednesday 22-Aug-18, St Paul’s Speakers rolled out the Red Carpet for an Oscar Inspired Evening of Public Speaking. Opening the proceedings was Rinat, Sergeant at Arms; who completed the house-keeping elements of the role with aplomb. This added an air of formality as she welcomed Rakesh, the club President to the stage. The Toastmaster for the evening was Lewis, who donned a Tuxedo jacket and Bow-tie, as if he were indeed hosting the academy awards. He kept the energy high whenever it was his turn to take to the stage and when introducing a new speaker, he commented on their favourite Oscar winner and fed it into that person’s personality and public speaking journey. Alessendro was the time keeper, or as put by Lewis, post-production editor. He gave the speakers concise reports of every speaker; commending those who that kept to their allotted time and for those who took a little too long, notes to take way and improve. Robyn was charming in the role Grammarian; with her beaming smile putting the audience in safe hands as she explained her role. Her report noted al the intriguing use of language which was used throughout the evening. Pedro was the first speaker to the stage and delivered his Ice-Breaker; who spoke about the fear of death. His voice was bold and his use of story-telling expertly set the scene; bringing it to life for the audience. The next speaker, also delivering their Ice-Breaker, was Tom; who spoke about his love of Cricket. Enthusiastic and Honest, he told the audience of how he was introduced to it, as well as delving into some of the unusual jargon found in the peculiar sport. The final speech was delivered by Chris who shared an anecdote of the perils of poor communication. He moved across the stage purposefully and his use of a prop added another level to the humour. Rinat was back to the stage with his welcoming of the guests, which he did with aplomb especially as he only joined as a member the week before! After the break came the evaluations and, in a change to the schedule, Kash evaluated Tom’s speech on Cricket. Whilst Kash confessed that he didn’t like Cricket himself, he commended Tom on his ability to engage with the audience on a subject that, for Kash at least, had little interest in. Caroline, who came to the rescue in a frantic change of scheduling, evaluated Pedro’s icebreaker. Her sincerity shone through and gave numerous commendations whilst providing recommendations for Pedro to work on. Michelle evaluated Chris and weaved in the Oscar-theme into her evaluation, linking commendations and recommendations to elements of a movie. Whilst it was a witty performance, Michelle packed it with plenty of technical assessment to be an excellent evaluation in its own right. Ling as asked which friend would she like to eat for dinner, the line taken from Hannibal Lecter in Silence of the Lambs. Clearly not a fan of the topic she was made to do, the friend she decided to consume was the Table Topic Master himself, Rakesh! Ashley, a guest to St Paul’s Speakers, explained how he could turn Rambo into a female friendly film. He likened Rambo’s war paint to that of a woman putting her make-up on for a night on the town, and he embodied such a woman with flair that had the audience in heaps of laughter. Sarah Hawkins, as Table-Topic Evaluator, gave articulate feedback for every speaker who took to the stage. Her commendations were rich with enthusiasm and her commendations insightful. Finally The General Evaluator, Niels, did an excellent job. With minimal notes, he delivered a commanding assessment where his voice carried through the entire space. To close the meeting, Rakesh came back to the stage and maintained the high energy present through the evening as closed the meeting in a comprehensive manner. The winners of the evening were Pedro, Michelle and Ashley for the Speech, Evaluation and Table Topic performances respectively. 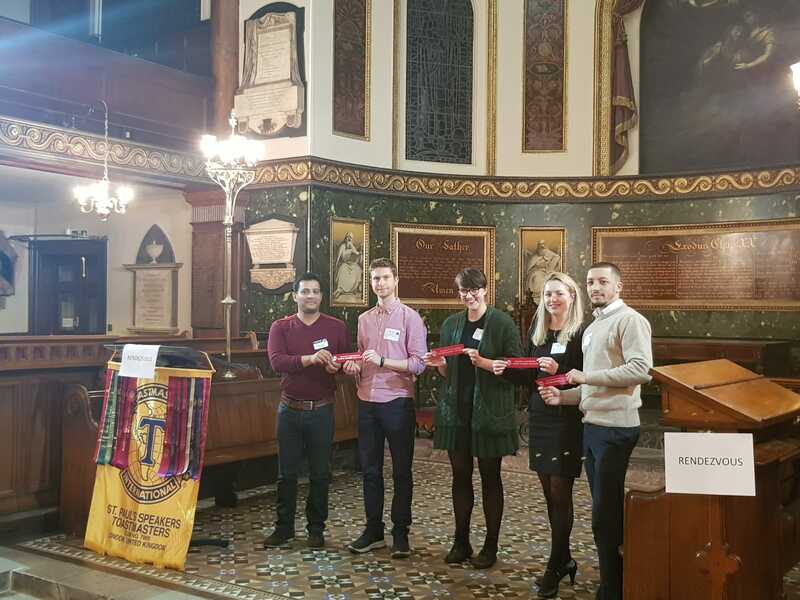 In a return to the traditional format, St Paul’s Speakers once again proved its value of being a friendly and welcoming club, with members feeling excited to attend the next meeting and guests feeling enthused to return to St Paul’s Speakers – The friendliest Toastmasters Club in London! 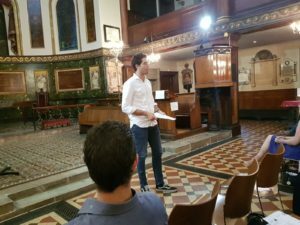 This Wednesday 08-Aug-18, St Paul’s Speakers were proud to host a very special guest; District 91 International Speech Contest Champion Fabio de Sio. Fabio has beaten off every competitor from the south of the UK to reach the Semi Finals which he will compete in next month in Chicago. 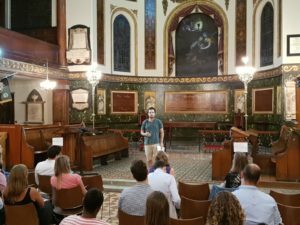 With Fabio performing two speeches, the format was slightly different and members were treated to an evaluation extravaganza! Opening the proceedings was Mayra, Sergeant at Arms; who completed the house-keeping elements of the role with aplomb. This added an air of formality as she welcomed Rakesh, the club President to the stage. Rakesh, as always, spoke with great enthusiasm and his excitement for what would be a great meeting, fed into the energy of the audience. The Toastmaster for the evening was Caroline, whose natural and relaxed delivery put the audience at ease. She introduced the speakers and functionaries, Alessandaro as Timekeeper and Alexander as Grammarian, smoothly and encouragingly. Alessendaro gave us concise reports of every speaker; commending those who that kept to their allotted time and for those who took a little too long, notes to take way and improve. Alexander owned his role of Grammarian; encouraging the audience to keep the energy high. When he delivered his report, he noted all the interesting uses of language throughout the meeting. The first speaker up was Sarah Beckwith, who gave a tutorial in how to evaluate. She drew from real life examples of what to commend and recommend from her experiences in evaluating club members, as well as giving some evaluation structure models for people to experiment with. Then the Fabulous Fabio took to the stage; charismatic and energetic, he commanded the stage with style and oozed authenticity. 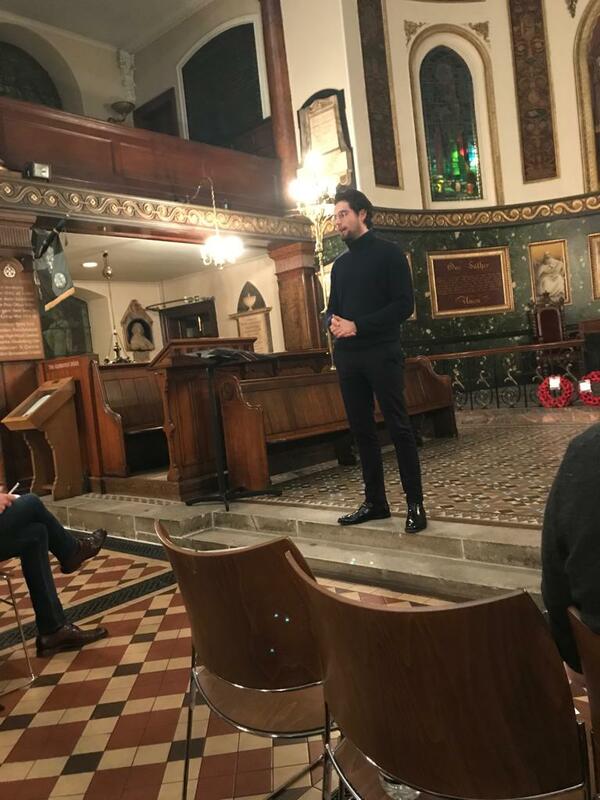 Whilst incredibly funny, Fabio didn’t shy away from sadder personal subject matter and gave the audience a revealing account of his life in both his speeches. Fabio performed a speech either side of the break with evaluations following immediately after. The first to evaluate Fabio’s first speech was Florian; commanding and composed, he highlighted the positives of the speech but with bold recommendations of how to take it to the next level. Robyn took to the stage next. A beaming smile on her face throughout conveyed her enjoyment of the speech. 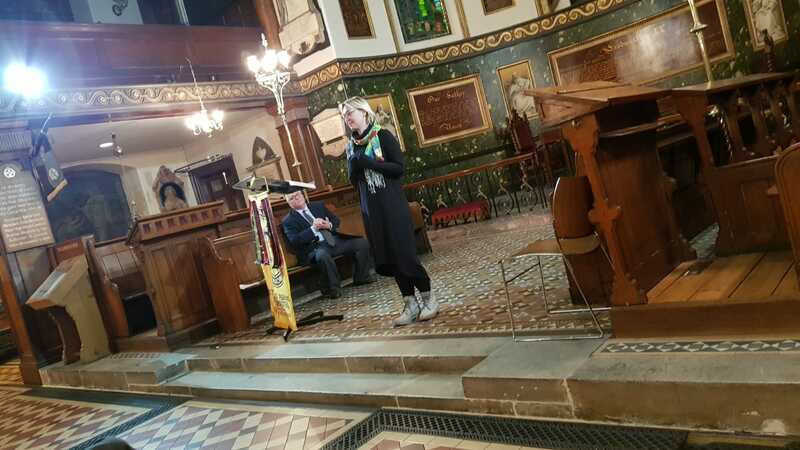 Her speech, however, was packed with structure; following a “Saw, Heard, Felt” format, she managed to find both commendations and recommendations in each section. Tom was then next up and in his first ever evaluation, was evaluating a District Champion. Nevertheless, he found succinct commendations and conveyed how he now had a “Man-Crush” on Fabio! Mayra was back to the stage with her welcoming of the guests, which she did with warmth and openness. Lewis was next up after the break, the first to evaluate Fabio’s second speech. He commended Fabio on his genuine performance and gave technical recommendations to accentuate some of the sadder moments of the story. Pedro, with a commanding voice, gave us a solid evaluation and demonstrated how the stage could be fully utilised by coming right into the audience. 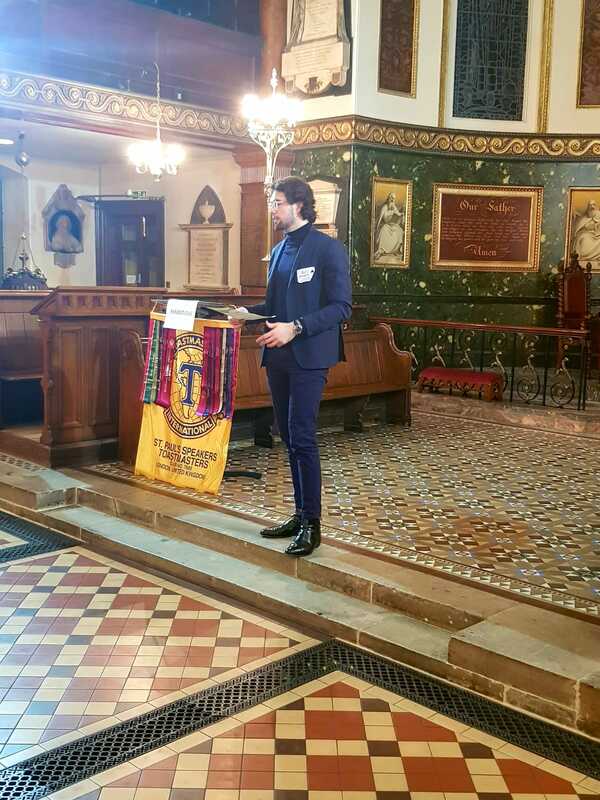 Finally, Chris gave an enthusiastic evaluation with nice technical commendations and as a recommendation, commented on the speech as a whole and the message Fabio was trying to communicate. The General Evaluator, Margherita, did an excellent job. With so few speakers and so many evaluators, she managed to give everyone at least one commendation and recommendation – all in the standard allocated time…just! To close the meeting, Rakesh came back to the stage. In what was a lovely touch, gave a mini general evaluation of everyone who came to the stage, highlighting everyone’s contribution to a memorable meeting. The two Evaluation winners, one from each section, were Florian and Chris. St Paul’s were also delighted to welcome Alessandaro and Rinat as members of the club. We are looking forward to them starting their Toastmasters journey with us. Whilst a break in the traditional format, St Paul’s Speakers once again proved its value of being a friendly and welcoming club, especially when welcoming a District Champion. To that end, St Paul’s Speakers wishes Fabio de Sio best of luck in Chicago! Overcome your fears of Public Speaking. Master communication skills and become a confident speaker at presentations. 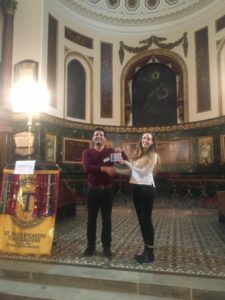 We are a London Toastmasters club, based in the City of London. 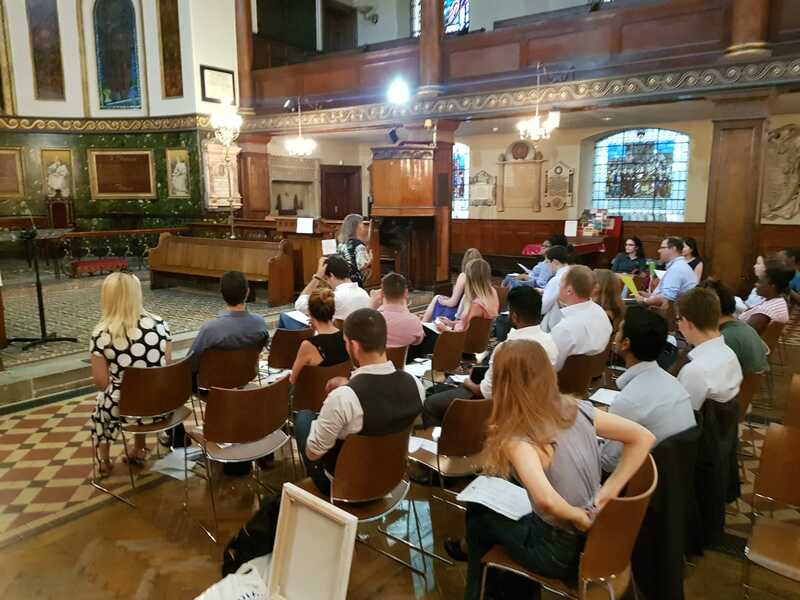 This Wednesday marked the first meeting of St Paul’s Speakers’ new President, Rakesh. He came to the stage brimming with confidence and charisma that he brings to every meeting and introduced our toastmaster for the evening Kash. Kash bounced onto the stage with enthusiasm and charm. 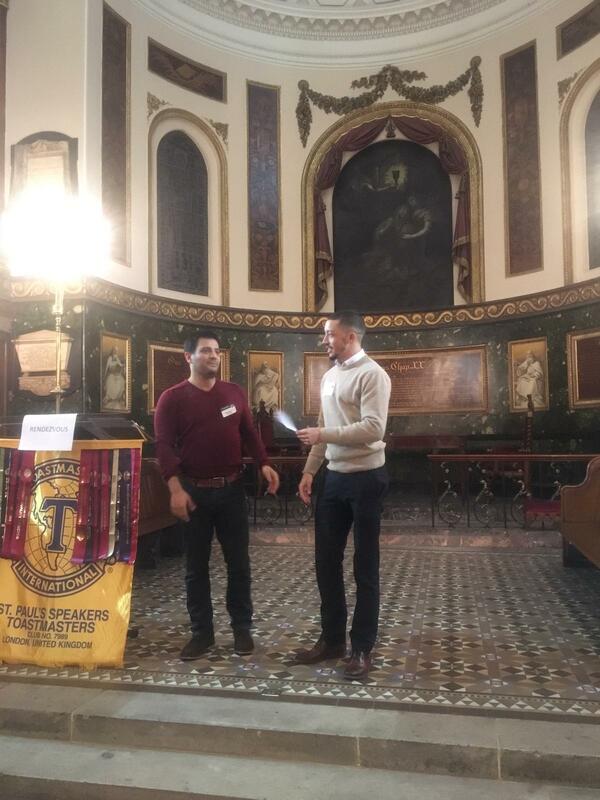 This was Kash’s first time as Toastmaster but his energy and composure, you would have been forgiven for thinking he was a Toastmaster veteran. He introduced the Functionaries, Tom as Timekeeper and Lewis as Grammarian (who then later stepped in as Sargent at Arms). Tom gave us concise reports of every speaker; great for those who that kept to their allotted time and for those who took a little too long, some food for thought. Lewis, in his Grammarian role; gave us the word of the day; ‘alleviate’. In his report, he was pleased to note it was used three times, even by a guest at Table Topics in what was her first ever Toastmasters meeting! He kept track of filler words used by the speakers and evaluators so that they can be aware of these habits and address that and continue their improvement. He also gave us a commentary of interesting uses of language, both in terms of clever techniques and other phrases that just stuck a chord with him. 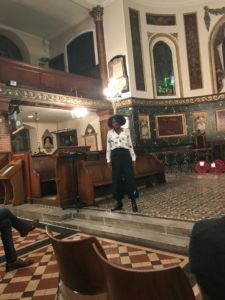 Our first Speaker of the meeting was Christelle, who told us why she has deleted Facebook, and is now looking to engage with ‘Real life friends’ not just Facebook friends. Caroline was next up with an account of how a bad-break up nearly cost her her best friend. 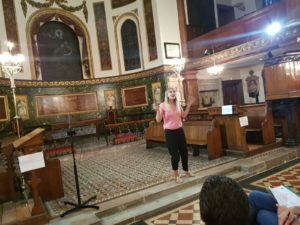 Caroline concluded a revealing account with such a poignant message – ‘Due to all the circumstances that led to my friend meeting her husband, none of their happiness would have happened if I didn’t have my heart broken.’ Her story touched a lot of the audience… as was discovered after the meeting at The Pub! 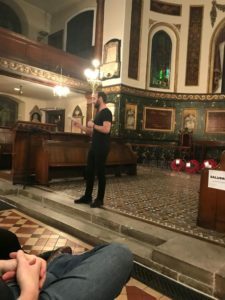 The final Speech was delivered by Adam who gave us a guide to Corporate Failure, rich with real-life examples of those who have failed spectacularly. He set up a clear structure and gave a robust delivery which parodied the inspirational styles of self-improvement you can find on Ted Talks. Lewis returned to the stage as Sergeant at Arms and welcomed the guests to share their favourite thing about Summer. With so many guests, there were a couple of repeat answers like “the long days” and “going out for beers and wine” which were met with hums of approval. After the break, the first evaluation up was Pedro, who gave an organised and accomplished evaluation on Chrystelle’s ‘Facebook speech’, with a commanding tone and valuable recommendations. Sarah evaluated Caroline’s speech and provided enlightening assessment. Sarah analysed the techniques which were present in Caroline’s speech and those which could be used to greater effect for Caroline to accentuate the heart of her message. Rakesh, the President (also dual-roling this evening) evaluated Adam’s speech on Corporate failure. His analysis was sharp with critique but rich in praise, and delivered in a style that matched Adam’s own enthusiastic performance. Chris, St Paul’s outgoing president, gave a technically encouraging Table Topic evaluation. Commending all which was fun and impressive from the speakers, with everyone taking something away to improve for next time. Our general Evaluator followed his starring role in Table Topics with a valuable assessment on St Paul’s Speakers. Realising the meeting was running a little over, he trimmed his evaluation so that the meeting would finish on time. With minimal notes at a commanding stage presence, Andy highlighted the energy and venue of the meeting as strong commendations – sentiments that were echoed by the guests. Overall, a meeting filled with energy and enthusiasm which was then taken to the pub to revel in the fun some more! If you would like to see what makes St Paul’s Speakers so special, please attend our next meeting on 8th August 2018. This happens to be a special meeting, where we are delighted to welcome Fabio de Sio, District 91 Speech Champion, to our club. Fabio will deliver both his Semi-Final and Final Speech to the club ahead of the World Finals in Chicago! St Paul’s Speakers belongs to District 91, so it’s a great chance to see your champion in the flesh! 27-June-18 | Reflections, eloquence and a moment of Zen with no “dilly dallying”! Our President Chris, quick wittingly took on the Toastmaster role and eased the meeting flow with his colourful selection of headwear changes! Our Timekeeper Allesandro (from a Toastmasters club in Rotterdam) kindly stepped into the role due to last minute absenteeism. He commanded the stage well and detailed perfect timings. Michelle brought into being our inner zen with her relaxing speech on Yoga. Khash reflected on how we see the world in new and differing perspectives. Sarah Beckworth truly brought to life the joy and prominence of language, ameliorating our range of words. Rax encouraged an end to procrastination prompting you all to pencil in a date for your next speech! Marvellous evaluations by Sarah Hawkins, Lewis, Robyn and Ashvin who all gave positive examples on how each speaker could implement improvements. Sarah Hawkins conducted a very witty table topic session, inviting each speaker to elaborate and explain their take on the meaning of forgotten words/phrases in bygone days. Our table topics speakers gave us their witty take on each word including a “monkeys wedding”! Myra as grammarian offered a fabulous word of the day ‘filibuster’ meaning “an action such as prolonged speaking which obstructs progress in a legislative assembly in a way that does not technically contravene the required procedures.” She treated the audience with a detailed “um and ahh” count for all our speakers. In addition to reminiscing noteworthy uses of grammar and metaphorical devices. Our General Evaluator, Marti Canal, delivered an exemplar and systematic detailed overview of the club and all functionary roles. Providing some valuable advice on how we might prepare the stage a little differently in future meetings. We thank him graciously for attending our club. Closing and final notes by our President Chris gave rise to pastures new. Marked by having graciously served his term and momentously handing over the official medallion to Rakesh who will be your new Club President from July.